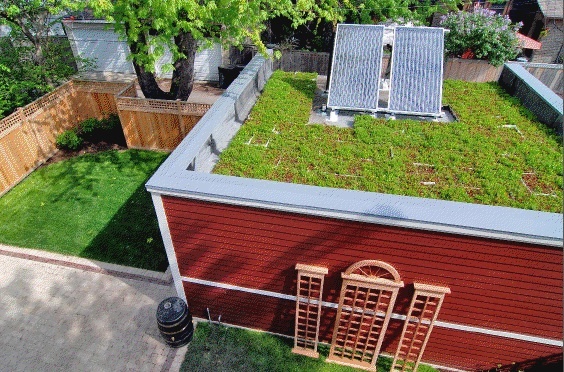 New Rooftop Law – Go Green – Literally! How much weight can your roof hold up? Can your roof hold up a garden on the roof? If you are building in France it better be extra strong! Why? Because they just passed a new law that mandates that all new buildings in commercial lots need to have either plants or solar panels on the roof. So whether it is a new office building, apartment complex or storefront, if it has a roof, you have to build green whether through solar or literally green living plants. This is happening in France right now and sounds like a great way to help reduce pollution and energy costs. So why do I worry about when the next shoe falls? Maybe because this is a government mandate. And it is so rare that when this starts with commercial building, it will no doubt expand to farms, outbuildings, sheds, anything used for commerce. Do you agree? In Austria and Germany this is happening without mandate. The photo above is of a complex developed in Austria without mandate and extremely successful! And being off grid – we especially work hard to be environmentally friendly! Plus there are many benefits to going solar and when the price is right, most people will want to do this on their own. But building so that it can support a garden? And how much is enough? Why is the mandate necessary? Maybe because then they can also mandate how the energy comes into the grid? Call me a conspiracy theorist, but I do worry when another government mandate comes down without the popular vote. Seems like it all comes down to government control. Read and then let me know what you think? Is this great or are you with me and wondering what will be the next shoe to drop? A new law that was passed that mandates that new buildings in commercial lots need to have either plants or solar panels on the roof. Plants create an isolating effect to help reduce the energy needed to heat or cool houses. Originally, French environmental activists wanted the law to cover the entire roof but they decided to start with participially covered roofs to see how it does. Solar panels on the roofs of businesses is amazing because it helps reduce the amount of energy they use while creating sustainable, renewable energy instead. When ideas like this come out, it’s both exciting and frustrating. Ready for off grid traveling for months at a time? © 2019 Off Grid Insights.